From the moment you arrive you know you have come to somewhere very special. Los Cristales is idyllic retreat situated on a private farm, with stunning, uninterrupted views all the way to North Africa. The house has spacious accommodation compromises a large sitting room, opening out onto an elegant south facing terrace, with seating for 12 around a large marble table. Centred on the generous entertaining space are 5 double bedrooms, 3 with en-suite bathrooms and private terraces. The mature landscaped garden with ample shade and a orchard has a 40 ft heated swimming pool and a barbeque area. The villa is located on the La Almuna Farm Estate and guests have the use of a communal tennis court. There are ceiling fans for use in the summer and a large fireplace in the sitting room and electrical heaters in the bedrooms for the winter. Although this beautiful villa is ideal for a summer holiday it also makes a wonderful getaway at any season. Ideal for mountain bikers and walkers. Ground floor sitting room with Sky TV, DVD player, portable CD player and drinks fridge. Open fire place surrounded by 2 large sofas and a comfortable chairs. The room opens onto a south facing terrace overlooking the gardens with distant views to Africa. Ground floor large kitchen/dining area with electric cooker, gas hob, large fridge/freezer, microwave, juicer, magimix blender, dishwasher and washing machine. Spacious worktops and dining table to seat 10. The kitchen opens onto the elegant terrace. Outside: A cobbled courtyard makes a welcoming entrance. The house is slightly elevated above the garden with stunning views from the south facing terrace across the valley and down to the coast. Gently sloping mature gardens with ample shade and numerous paths to secluded areas of tranquility and access to an orchard provide plenty of opportunities for children to safely explore the 2-acre garden. The attractive heated 40 ft free-form private swimming pool is located at the bottom of a gently sloping terrace. There are numerous sun loungers and chairs surrounding the pool. The property is securely fenced. There is a barbeque conveniently located near the house and terrace.There is an undercover parking area directly outside the main entrance and there is ample parking for 4 cars approximately 15 metres from the main entrance. Utility Room: The utility room is used by the maid and not available for public use. Cleaning / Towels / Linen / Maid service: Maid service of 2 hours, 2 days a week is included in the rental. All linen and towels are included in the rental. Cook available privately if required. A cot is available for £25 and a high chair for £20 per week. We had the most wonderful holiday at Los Cristales. It was perfect for everyone - young and old - and it is somewhere we would most certainly like to return to. My son-in-law arrived weary with business hassle, and thoroughly exhausted after a heavy and difficult workload. He continued to relax and after two weeks was a different person - for the better. We all benefitted from the wonderful villa - the comfortable bedrooms, the easy living space, and the magnificent, beautifully landscaped garden. The children - 9, 7 and 5, lived in the pool, and as the weather was perfect, the rest of us swam - to a greater or lesser degree. Again the design of the pool,surrounded by lawn, was wonderful, and lovely to get away from the usual formal rectangular ones. And as for the view - well, we gazed and marvelled at the surrounding countryside, the Mediterranian, and the Rif Mountains hourly! Two of our party much enjoyed riding up in the mountains with the english lady just along the road from us. And Gaucin was a delightful village where it was a pleasure to stroll. We did love the comfortable lived in feel of the house, which is always a bonus with little children. Antonia looked after the house really well and was discreet and charming, supplying us with lots of good towels. And Jose-Maria kept the garden and pool in very good order. 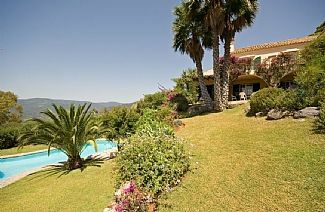 The house is located approx 45 minutes drive to the Mediterranean coast and approximately 1 hour from the stunning beaches of the Atlantic coast. Among the many beaches along the coast is Tarifa, 100km, renowned for its windsurfing and kite surfing. Estepona beach 46 km. Puerto Banus 62km. Marbella 67km. The picturesque hill-top village of Casares 25km. Jimena de la Frontera Castle and white-washed village 20km. The beautiful fortified town of Rhonda is 44km. Closet airports: Malaga 125km (approximately 1.5 hour drive). Gibraltar 67km (approximately 1 hour drive). Car hire: You are advised that you will need a car for the duration of your stay. we can advise on local car hire firms if needed. Shops and restaurants in Gaucin and San Pablo are 7km. Shared tennis court and horse riding (fee involved) on La Almuna Farm 500m. Gold at Sotogrande 44km. Rhonda with its celebrated Bull Ring, 1 hour drive. The picturesque hill-top village of Casares 25km. Jimena de la Frontera Castle and white-washed village 20km. The beautiful fortified town of Rhonda is 44 kms. Golf and shopping at Sotogrande 44km. There are numerous small supermarkets in Gaucin and an excellent bakery and delicatessens selling quality home-cooked food. There is a health food shop where you can buy a variety of local organic produce. The shop has an internet cafe. There are many tapas bars and restaurants in Gaucin serving both local and international cuisine. The house is located on a charming working farm along an unpaved road. There are many lovely walks from the house around the farm. Along the way you can see sheep, goats and cows grazing in the fields. There is a small dairy where the sheep are milked every day. 20 minutes drive away is the stunning Alcornocales National Forest, Europe's largest cork forest. There are numerous mountain biking and walking tracks through the forest catering for all levels of fitness and expertise. There are many activities to do on the Atlantic and Mediterranean coast. Excellent shopping at Marbella and Puerto Banus. Calm family-friendly beaches in Estepona and Marbella. There is fantastic kite surfing and windsurfing on the ocean beaches in Tarifa and Bologna. The busy port of Tangiers in Morocco is easily accessible by high speed ferry from the town of Tarifa (1 hour from the house). The journey takes 50 minutes. Tangiers is a bustling and vibrant town, there are many wonderful markets and places of interest to visit. A highly recommended day out. The house is located on a migratory route for birds moving between Africa and Europe. Soaring vultures, swallows and many other birds regularly fill the sky. A bird watcher's paradise. A full information pack, giving details of local restaurants and places of interest will be available at the house. Booking Notes: 10% deposit of full rental price is required to secure booking. Full payment is required six weeks in advance. Nightly rentals available during low and winter season. Changeover Day: Changeover day is on a Friday and checkout time is 10.00 am and we request all guests respect this. Notes on prices: Prices, which may change, normally range from £2,300 to £2,750 per week, depending on season. For availability please contact Sam Sheppard. Mobile phone 07976 744424.